This is something different but as soon as I finished reading Things Fall Apart I realised I didn't want to review a seminal text that has been read my millions and reviewed by many. I actually just wanted to share my thoughts on the book. 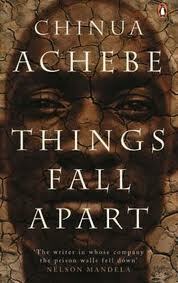 While I know that Things Fall Apart is cliched and an obvious first choice for someone who has never read Chinua Achebe (I was initially going to read Arrow of God), I chose to read it when I realised that it was the first in a sort of trilogy and No Longer at Ease and Arrow of God featured the descendants of Okonkwo (the main character in Things Fall Apart). Once I knew that, I realised Things Fall Apart was an obvious first choice because I wanted to start at the beginning so I could understand the end. Things Fall Apart tells the story of Okonkwo from Umuofia (one of nine villages inhabited by Igbo's in Nigeria). It focuses on his life in Umuofia with his three wives and children, his exile from his village, and finally his struggle with British colonialism and Christian missionaries. The first thing I thought as I was reading it was 'I get the hype'. I get why people rave so much about this book, especially considering when it was written. Here is a book that was trying to inform the world that only knew of Africa as 'backwards', 'the Other', or as Joseph Conrad called it 'the heart of darkness'. The book introduced Igbo culture and traditions with meaning and value. I also loved the way it was written, very clear and simple, and I especially loved the choice of formal language, which was portraying a different side of Africa and the African (or in the case Igbo) language. The second was the themes. There were so many themes jumping out as I was reading. Okonkwo, for example, trying to resist the political, cultural and religious changes that were occurring. Masculinity was another. Okonkwo didn't want to be portrayed as weak, as a woman, as his father (who was weak). His own version of masculinity was aggression, anger, never showing any weakness. This was why he didn't think much of his first son, Nwoye, who he saw as effeminate, weak, and not a real man. What was interesting was how he kept on wishing that Ezinma, his daughter and favourite child, were a boy because she portrayed qualities that he felt men should possess. We are also shown alternative forms of masculinity from Okonwo throughout the novel. When I finished reading I thought the same thing again 'I get the hype'. I really, really loved the book and the only thing I'm sad about is that it took me so long to finally read it. Now I am really looking forward to reading the rest of his 'African Trilogy'. Fantastic review. The book really does deserve the praise it gets doesn't it? I found it more boring than some of his other works (I really do still prefer Arrow of God!) but it just contains so much! It really does. I thought maybe people used to say it was amazing just because it's Chinua Achebe, but it really is . And if you say you found it more boring than some of his others then I can't wait to read Arrow of God. Actually, it's more of a loose trilogy. Arrow of God is my opinion is Achebe's best work and it rankles a bit that Things Fall Apart gets most of the attention. Still, it's a good book. You have to read it so I definitely will. And don't worry. There are loads of books on my wish-list :). You'll still be able to get me some.